Since the turn of the century, independent soul has gradually gained more and more steam as a movement of talented, multi-faceted artists with distinctive songs and compelling messages that are often deemed too sophisticated by major-label A&R personnel. Though self-sufficient R&B singers have been putting out records for the better part of a century, too few who started in the pre-Internet days have persevered through the ever-changing paradigms of distribution which have since ensued. 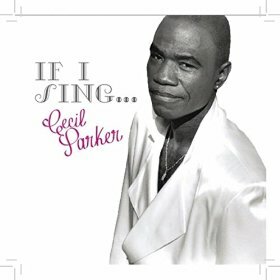 That’s why If I Sing…, the fourth full-length album by Philadelphia-based Cecil Parker, is such an exemplary testament to the power of persistence and the value of authenticity. Parker first grabbed the attention of listeners in 1980 with the breezy “Really Really Love You,” which went on to become a rare-groove classic in the UK. Although his first LP, Chirpin’, showed signs of that success continuing, the folding of the label to which he was signed at the time resulted in a loss of momentum by the time he had found a new recording home. Rather than repeating the unpredictable cycle, the silky-voiced crooner took matters into his own hands with the self-written, self-released ballad, “I’m So Hurt,” in 1985. In the decades since, he’s put out collections like the eclectic Essensual and the romantic For You that testify to his respect for heartfelt melodies and tasteful lyrics. On If I Sing…, Parker has found an ideal balance of classic and contemporary with a concentrated—but not over-thought—ten-song selection of endearing ballads, cool midtempo tracks, and uptempo ditties. The seductive opener, “When It’s Time,” bears a supple arrangement with a charming ‘80s vibe, delightfully complementing his gentle falsetto delivery and understated, yet persuasive, lyrics. An appropriately moody cover of the Luther Vandross nugget “Love Don’t Love You” and the Al Green-esque “Somebody”—replete with bright organ sounds and an engaging chorus—both invite with emphasis on the melody and smoothly cogitated production. The reflective “I Love You” blends a melody that brings to mind The Stylistics with a rhythmic backbone that is decidedly modern in stance without detracting from the timeless words. The aforementioned “Really Really Love You,” as well as the sought-after ‘80s gems “I Think I’ll Tell Her” and “You’re Everything to Me” (both produced by the late Vince Montana, Jr.) are included on If I Sing…, serving as evidence that Parker’s voice has remained strong and sparkling throughout the years. Varying the pace and atmosphere a bit, the danceable “Wit U” grooves with party-driven lyrics and a percussive synth groove on which he maintains his cool while letting fashionably loose. Recommended.